Nominated for nine Academy Awards, including Best Picture, Apollo 13 is now available in an incredible 2-Disc Anniversary Edition with never-before-seen bonus materials. 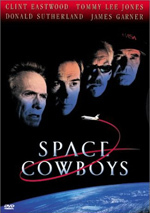 Produced by Academy Award winner Brian Grazer and directed by Oscar winner Ron Howard, Apollo 13 stars Tom Hanks, Bill Paxton, Kevin Bacon, Gary Sinise and Ed Harris in the inspiring and riveting story of the real-life space flight that gripped a nation and changed the world. $25.000 million on -unknown- screens. Most movies find it hard enough to keep us interested when we don't know precisely how the story will end. After all, how many genuinely unpredictable films are there? Some - like Se7en or The Sixth Sense - catch us off-guard with twists, but the vast majority of movies feature tales and outcomes that are easily anticipated. It's not like we ever actually think James Bond won't survive his encounters. The predictability factor becomes all the more intense when the film in question sticks to a historical topic. In those cases, the ending is never in doubt because the filmmakers can't deviate from fact. There are some ways around this, to a certain degree. Some films - like Saving Private Ryan or Titanic - create fictional characters amidst factual action, and that opens creative opportunities. Others such as The Insider stick to completely true events but maintain an air of unpredictability because the topics aren't well-known to many. Neither of those advantages were available to the makers of 1995’s Apollo 13. In fact, it had every disadvantage that one could attach to this kind of project. It dealt with a fairly recent event, which meant quite a few members of the audience would still remember it from first-hand experience and could compare the two. It also featured a pretty high-profile incident, since it focused on the space program in the early Seventies. Those two strikes could have doomed the movie right there, but Apollo also tempts fate since it bases most of its drama upon the tension surrounding the fates of three astronauts aboard an ill-fated mission. We know exactly how the story will end, as all three of them survive. Even if you don't know this prior to the start of the movie, the opening credits show that the movie was based on a book by astronaut Jim Lovell, so it's pretty clear he'll make it to the end, and that means it's a good bet the others will too. Apollo is a wonderful example of how fine a "feel-good" movie can be. Too many of these are marred by excessive and artificial sentiment, and every once in a while, you can see that Apollo starts to travel down that path. However, it never quite gets there, and the movie manages to maintain a nice stiff upper lip throughout most of the events. To be sure, the film packs a considerable emotional punch, but Howard achieves this the old-fashioned way with well-drawn and interesting characters, not through cheap theatrics. It helps that Apollo features an excellent cast headed by Tom Hanks. He was coming off of two straight Best Actor Oscars and might have gotten a third nod had he not experienced a minor backlash due to his good fortune. I don't know if Hanks' portrayal of Lovell really was award-worthy or not, but he does a very nice job. He and most of the other actors seem a little too emotional for my liking. Those NASA types always come across as very detached and stoic, and I don't think that's just an act for public consumption; I believe those attitudes become ingrained in their personalities and exist most of the time. However, Hanks never goes over the top with his gusto, and since it seems likely his added emotionality - as well as that of the others - comes in the interest of making the characters more believable to the general public, I'll forgive him. Overall Hanks does a fine job, however, especially in the way he conveys the honor and dignity of Lovell. He also gives us some nice insight into the awe and wonder with which Lovell regards space, and his eagerness to be there. Hanks' performance covers a lot of bases and does so adeptly; he makes Lovell a very three-dimensional and real character. As I said, this may not be an award-worthy performance, but I think Hanks tops his work in Philadelphia and Forrest Gump. Hanks played a symbol in the first one, and Gump was nothing more than a cartoon character. Lovell is the only real person of the three. Since they receive much less screen time, the other actors don't fare quite as well, but a solid cast helps make every aspect of the story work. As fellow astronauts Fred Haise and Jack Swigert, Bill Paxton and Kevin Bacon provide solid support in the spacecraft, especially in the ways the three bounce off of each other. The men maintain a believable chemistry and interact naturally. Back on the ground, Gary Sinise and Ed Harris lead the way, and both of them offer their usual fine work, along with Kathleen Quinlan's emotional but firm turn as Lovell's wife Marilyn. The film still might have succeeded without such a terrific supporting crew, but their inclusion makes it all the more solid. There's not much to dislike about Apollo 13. The movie may run a little too long, and perhaps it could have avoided some of the factual liberties it takes, but these are minor gripes in the face of a generally fine film. Ron Howard has a very spotty track record as a director, but Apollo is his one almost total success. 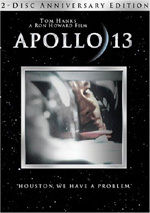 Apollo 13 appears in an aspect ratio of approximately 2.35:1 on this single-sided, double-layered DVD; the image has been enhanced for 16X9 televisions. This “10th Anniversary Edition” touts an “all-new digitally remastered picture”, and indeed the 2005 DVD presented the best rendition of the visuals yet seen. Sharpness usually seemed nicely crisp and detailed, although a few wider shots occasionally betrayed some vague softness. Those instances remained minor, though. I linked the slightly lack of definition to the mild edge enhancement that sometimes crept into the transfer. The haloes weren’t severe, but they were noticeable, especially during the movie’s first act; once we spent more time in the darkness of space, they were less obvious. Moiré effects and jagged edges also were an occasional concern, though they only popped up sporadically. Very few source flaws became obvious. I noticed a speck here or there, but not anything to create distractions. Grain looked a bit heavier than one might expect, though that likely was an outgrowth of the Super 35 photography; films shot that way usually look grainy when compared to flicks made with other processes. Colors represented the natural look of the piece and seemed nicely realistic and accurate. The film got the slightly garish fashion sense of the era down well, and it replicated the hues splendidly. Reds fared especially well, but all hues were clear and rich. Black levels seemed deep and dark without any excessive heaviness, and shadow detail looked appropriately opaque. All in all, the film offered a strong image that fell to a “B+” mainly due to the mild softness and edge enhancement. Even better was the Dolby Digital 5.1 soundtrack of Apollo 13. The soundfield seemed wonderfully detailed and lively throughout the whole film. The sequences that related to the spacecraft stood out the most strongly, of course, but even "ordinary" scenes in mission control or in homes sounded realistic and active. The forward speakers were in constant use, with a great deal of ambient sound and music coming from the right and the left. Audio quality also appeared positive. A smidgen of edginess occurred, but speech usually sounded clear and natural, with no concerns related to intelligibility. Effects were always accurate and realistic, with very little evidence of distortion. Some of the usual suspects such as explosions and jet engines display minor crackling, but that's almost inevitable. Music appeared very dynamic and clean, with smooth highs and some deep lows. Across the board, bass sounded excellent. The track will give your subwoofer a workout. Overall, the soundtrack of Apollo seemed terrific. How do the picture and audio of this “10th Anniversary Edition” of Apollo 13 compare to those of the original 1998 DVD? I thought the two soundtracks were identical; unfortunately, this version of the film fails to present a DTS mix, though the “IMAX Experience” cut I’ll soon discuss does. That meant an apples to apples comparison between the old and new DVDs, and I heard nothing to differentiate the two Dolby tracks. However, the transfer for the “10th Anniversary Edition” clearly improved upon that of the original. The pair looked similar in many ways, but the new one cleaned up matters noticeably. It featured fewer source flaws and was consistently more pleasing. Although the original offered a strong roster of extras, the “10th Anniversary Edition” improves on those as well. For the supplements on this two-disc set, DVD One mostly replicates the materials from the original. I’ll note everything that repeats from the 1998 release with an asterisk. DVD One includes two separate audio commentaries. The first comes from *director Ron Howard as he offers a running, screen-specific chat. Howard provides a lot of background about the film. Howard mixes a nice sampling of remarks about both the technical aspects of making the movie and the historical facts behind the picture. He spends too much time telling us when shots were done aboard the "Vomit Comet" and when they weren't, but overall this is an enjoyable and informative track. The second commentary presents *astronaut Jim Lovell and his wife Marilyn. This one starts slowly, as in the early moments, Jim does little more than say "Remember that?" to Marilyn. However, once the two of them get more comfortable with the format and the movie's action heats up it becomes more compelling. Jim offers a lot of good details about the factual side of the mission; he points out how the movie differs from reality and helps fill in some of the gaps. Next up is a 58-minute and three-second documentary about the film called *Lost Moon: The Triumph of Apollo 13. This is a truly terrific piece of work. The program involves Howard, Jim Lovell, Marilyn Lovell, producer Brian Grazer, executive producer Todd Hallowell, visual effects supervisor Robert Legato, lead digital compositor Mark Forker, astronauts Fred Haise, Dave Scott, Apollo 13 flight director Gerald Griffin, command module systems controller Sy Lieberglot, Apollo 13 flight dynamics officer Jerry Bostick, mission control director Gene Krantz, Tom Kelly of Grumman, NASA mission operations director Christopher Kraft, daughters Susan Lovell Williams and Margaret Haise, command systems module controller John Aaron, and actors Tom Hanks, Bill Paxton, Kevin Bacon, Gary Sinise, Kathleen Quinlan, and Ed Harris. The show offers a mix of film clips, interview segments and archival footage from the era itself. That latter aspect is maybe the most compelling. 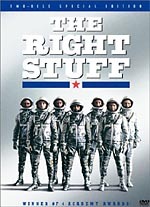 The documentary starts with a clip from Johnny Carson and "The Tonight Show", ends with a speech from Nixon about the mission and hits on all sorts of other great material in between those points as we find out about the actual flight and its issues. For movie material, we also learn about how the project made it to the screen, casting, shooting in the “Vomit Comet”, the quest for accuracy and telling the story, approaches to the various roles, visual effects, and general production information. The show balances historical observations and data about the flight along with movie-making notes to create a very informative and enjoyable documentary. A few short extras fill out the first disc. *Production Notes provide some nice details about the making of the film. There's nothing here that's terribly new, since most of it's already stated in the other sections, but it reads well. DVD One also includes the movie’s *trailer plus a preview for the new Ron Howard flick Cinderella Man. With that we head to DVD Two. Its main feature presents an oddity: the IMAX Experience Version of Apollo 13. How does this differ from the original theatrical cut of the film? It changes the movie’s aspect ratio from 2.35:1 to 1.66:1, and it also loses 24 minutes of footage; the IMAX version runs only 116 minutes. That’s the main reason I have virtually no interest in watching the IMAX edition. Not only does it use an altered aspect ratio, but it tosses out an awful lot of film. As a real kick in the head, the IMAX disc includes a DTS 5.1 soundtrack whereas the theatrical cut does not. That means you still have to buy a separate disc to get the theatrical version with DTS, and that stinks. The IMAX cut is an interesting curiosity, but I’ll never watch it. Really - what’s the point of an IMAX presentation on a small screen when there’s another superior way to see that film in that setting? Two new documentaries show up on DVD Two. Conquering Space: The Moon and Beyond runs 48 minutes and 24 seconds and looks at issues connected to space exploration. We see archival material and hear modern comments from Lovell, NASA astronauts Shannon W. Lucid, Roger K. Crouch, NASA astronomer Ann Kinney, NASA Mars scientist James Garvin, and NASA solar system scientist Colleen Hartman. The program starts with the roots of the “space race” between the US and the USSR and continues with the development of NASA and the “Mercury Seven”. We see the early achievements and setbacks as well as the push to get to the moon with the Gemini and Apollo programs, the Apollo 11 landing, NASA’s quest to examine the rest of the solar system, close-up looks at Mars and other exploratory issues, additional space flights and problems like the Challenger explosion. Finally, we get the 12-minute and 13-second Lucky 13: The Astronauts’ Story. This “Dateline” segment offers more archival materials, some film clips, and remarks from Jim Lovell, Marilyn Lovell, Fred Haise, Sy Liebergott, John Aaron and Gene Krantz. “Story” presents a quick overview of the events that occurred during the Apollo 13 mission. It’s a good little synopsis, but it brings almost nothing new to the table. I think it just rehashes the same information heard elsewhere. Does this new version of Apollo 13 lose anything from the old package? Yes. It drops short “Cast and Crew” biographies for Howard and six of the actors, and it also eliminates set’s booklet with some production notes. Those almost exactly copied the text found on DVD One, though, so they don’t go missed. Fans of isolated scores will be disappointed the original DVD’s “Easter egg” fails to appear here. If you went to the main menu and let the old disc play, you’d get its full score on its own. That doesn’t repeat here, I’m afraid. Despite that omission, this remains a terrific set. Apollo 13 remains an excellent film that provides suspense, drama and emotion all with dignity and flair. The DVD provides very good picture and sound plus some simply fantastic supplements. Put simply, Apollo 13 is an excellent package that I strongly recommend. This is definitely the version to get if you don’t already own a DVD of Apollo 13. Should you “upgrade” if you possess the original 1998 release? Probably. While the audio remains identical, the new version improves the old one’s picture quality, and it also adds some good extras. Note also that a lot of people - myself included - have run into problems with their copies of the original DVDs. Mine no longer works. When I put it into a player, the machine doesn’t recognize it. Not everyone’s discs run into those concerns, but this isn’t an isolated incident.